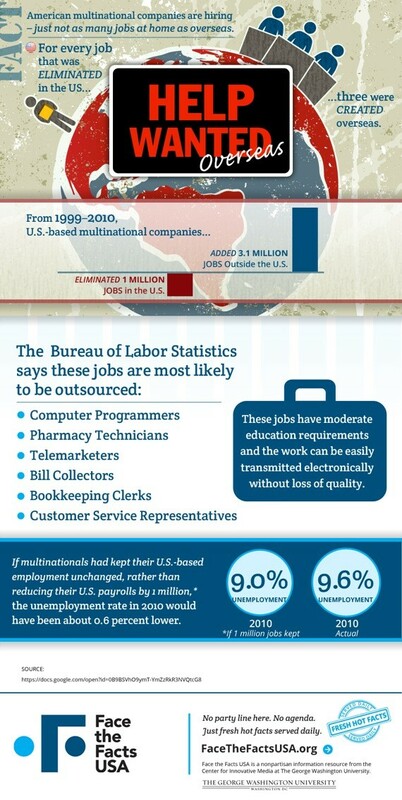 US-based multinational companies eliminated 1 million jobs from the US workforce between 1999 and 2010 while adding 3.1 million in other countries. If those companies had kept their domestic hires working instead of laying them off, the US unemployment rate in 2010 would have been 9.0 percent instead of the actual 9.6 percent. More details in today's infographic. Check it out, then weigh in down below. What corporate behavior do you favor? Face the Facts USA is a project of The George Washington University's School of Media and Public Affairs. Would you like the "Fact of the Day" beamed straight to your email inbox? Sign up here. For more fun stuff, follow them on Twitter @FaceFactsUSA, or like them on Facebook.